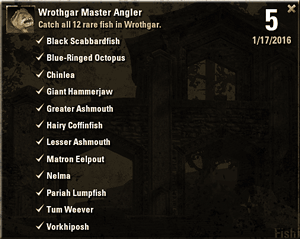 Last night, I managed to complete the Wrothgar Master Angler! I have updated my fishing list to reflect the fish found in Wrothgar grouped by water type. Previous PostESOTU Patch Notes v2.2.9 – Crafting SummaryNext PostESOTU Tremendous Healer Achievement!